The stylistic imagery of these grand gardens was often used to suggest social prominence. Gardens reminiscent of France and Italy in the 17th century appeared alongside English natural landscapes and romantic Spanish courtyards. The use of these images reflected predilections based on perceived ideals of ancestry, travel or social pretension. Examples of such "showplace gardens" abound. At his "Greystone" mansion in Beverly Hills, Edward Doheny formulated a grand estate with expansive lawns and formal gardens which incorporated several English design traditions. At San Simeon, William Randolf Hearst created an extraordinary fantasy landscape. With a panache that is almost vulgar, Hearst united the details of the intimate and exquisite gardens of Spain with the lavish Baroque gardens of Italy. In San Marino, Henry Huntington's estate celebrated a series of plant collections as varied and important as the exquisite books and manuscripts in his library, and the paintings and furniture in his house. On the other hand, Rancho Los Alamitos stands apart from the obvious opulence of many estates of the period. In 1932, Marian Cran, the English garden writer, celebrated Rancho Los Alamitos as a rare example of a "pioneer home" in California. Her sensitive appreciation of Florence Bixby's gardens emphasizes their understated elegance. The existing gardens were created between 1920 and 1936 and while such notable design­ers as the Olmsted Brothers Firm, Florence Yoch, and Paul Howard were involved, the guiding influence is clearly that of Florence Bixby. The gardens at Rancho Los Alamitos eloquently express the personality of their creator, Florence Green Bixby, a modest, inward-looking woman who was never quite able to embrace the robust, ranching activity so loved by her husband. Photographic evidence indicates that there were no really rare or difficult-to-maintain plantings in Florence Bixby's garden. Rather, in developing her gardens, she attempted to "civilize" the area around the rambling adobe ranch house in a way that complemented the home and expressed her own taste and interests. Florence Bixby's elegant gardens are notable for the way in which they extend a modest domestic tranquility into the garden. The restrained plant palette in combination with the beautifully dimensioned spaces give quiet strength and character to the garden. Created in an age of flamboyance, the gardens at Rancho Los Alamitos represent a remarkable personal aesthetic, sensitive to the traditions and scale of the past, and at ease with the relaxed dictates of outdoor living. David Streatfield is Professor of Landscape Architecture at the University of Washington in Seattle and a respected authority on the history of landscape design. He has authored many articles on his area of special interest, the evolution of the landscape and gardens of Califomia. 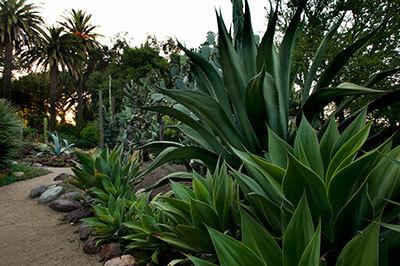 For over a decade, Mr. Streaffield has served as consulting Garden Historian for Rancho Los Alamitos.